This fairly large size 17th century white glazed ware came from the famous Cizhou kiln (磁州窑), one of the five famous Chinese kilns or glazes. Cizhou ware is most known for having been produced in northern China, primarily in Hebei, Henna, Shandong, and Shanxi. The name of Cizhou (磁州) came from a location in Hebei Province. 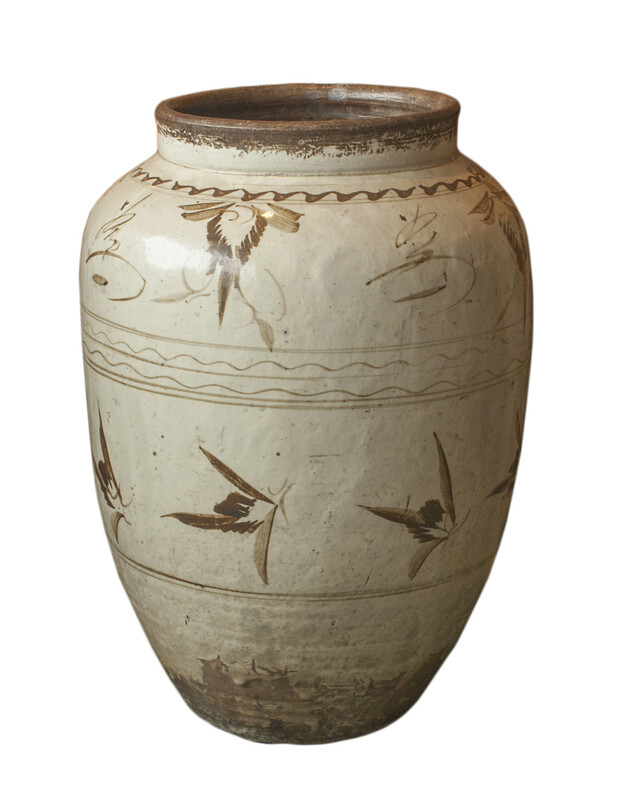 Cizhou ware is known for its thick white or cream-white glaze with paintings of brush strokes or carved design. The brush work mostly are painted in a dark brown, almost black, color in various shades, freely painted in its artistry like that in some of the traditional Chinese brush paintings. It is said to be the first pottery ware created with decorative colors and design while all other four kilns out of the famous five produced almost exclusively wares with singular color glaze during the same period of time dating back to Northern Song (960-1127) . Although Cizhou ware later on was also produced for the imperial use such as during the Ming Dynasty, it is mostly known for being produced for utilitarian wares. Cizhou wares were among the most popular porcelain wares in northern China at its peak during the Song, Jin, and Yuan Dynasty (宋金元) .One often compared it to the Jing-De-Zhen ware in the South. Cizhou kiln also produced what was called “green ware” . A successfully fired Cizhou ware would have a very thick and even white or cream-white glaze in color. The cream-white glaze often shows a soft glaze like the old patina on an old white jade piece that glows in its subtlety with a pleasant feel to the eyes. The good strokes of the dark brown color painting on the pottery would feel very free yet still sophisticated in its expression. Because it was mostly produced as utilitarian ware by quantity, finding ones that were perfectly painted and fired could be challenging. This jar was probably used as a wine storage jar. The painted design on the jar includes a flying leafy design and a written character that could be “Shou” (壽，longevity) “ or “Wan“ (萬，abundance). Dimensions: Approximately 18” Diameter x 25” Height.